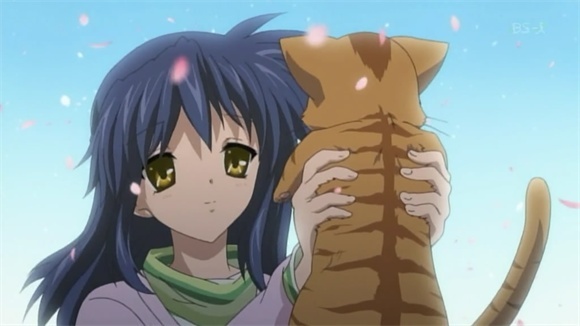 While spoilers are the norm around here, I feel I should warn people again for this post—there are enormous spoilers for Clannad and After Story here, and if you haven’t seen them both all the way through then you should probably do that instead of reading this post. 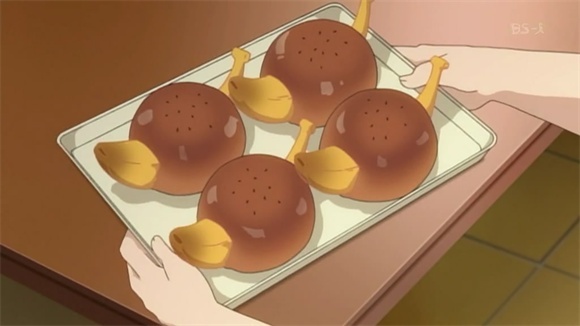 But if you have, or you’ve played the visual novel, please enjoy the ninth of my Twelve Moments of Anime 2009. There’s a lot that can be said about Clannad; like the other Key/KyoAni series, it’s a bit of a tearjerker, but unlike Kanon and Air, it has quite a bit of light-hearted comedy included as well. 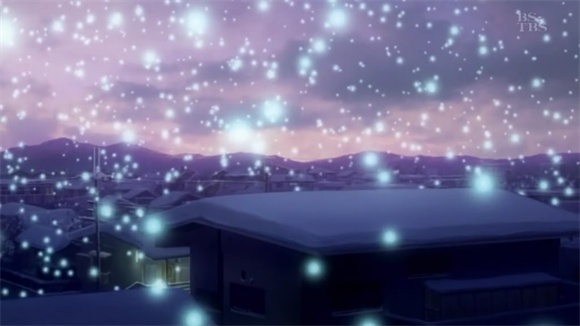 Unlike most school romance shows, it bothers to follow the lives of the characters both after the confession and after they leave school to try to make lives for themselves. But all that’s been written to death. Banana bread does not work that way. Clannad’s characters are extremely well-developed; Nagisa’s story only takes up a little over half of the two seasons of the anime series. Practically every major character has their own two or three episode arc, from the big idols like Tomoyo and Kotomi to minor characters like Misae and Yukine. I suppose part of this comes from the numerous different paths through the Clannad visual novel, but Clannad manages to weave its way through almost all of the plot arcs from the VN. And though some of these had to be modified to preserve continuity and a couple of arcs eliminated, the arcs in the anime series stick pretty close to the visual novel paths, which means they’re extremely good. I thought Misae's arc was great, but apparently the rest of the world disagrees. I can’t think of another series that follows a single obviously main storyline and also has several extremely high-quality side stories focused on its supporting characters. Clannad‘s stories go beyond character development to the point where they can stand on their own as worthwhile plots, and I felt emotionally involved in all of them. Misae’s arc is still one of my favorites (I don’t know why everyone else seemed to think it and Yukine’s arcs were lousy), and I still feel like Tomoyo’s path is, in a way, more tragic than Nagisa’s. Again, this might be because of Clannad‘s visual novel roots (one of the better paths in the VN follows Hiiragi Kappei, who first appears when he gets run over by Kyou and, if you’re not lucky or careful, you never see again), but it’s still hard to translate the parallel structure of a VN into a linear anime series. The amazing thing is that despite the strength of Clannad‘s side stories, the main plot is still that much better. Nagisa and Tomoya develop immensely over the course of their relationship, and it’s really fulfilling to watch them grow. Even though they have to overcome many obstacles and hardships, that feeling of triumph is uplifting. But that’s not /really/ why you’re watching a Key/KyoAni series, is it? Clannad‘s primary plot has plenty of moving moments, with its fair share of tragic events. The obvious tragic moment in the main story is Nagisa’s death; while Ushio is born safely, Nagisa has used all her strength and her life slips away, even as Tomoya’s desperate words try to coax her back. Even though Nagisa’s condition grew worse for several episodes, her death is still a huge blow to our emotions; she’s been one of the main characters for over a season and a half. Tomoya’s journey of redemption with Ushio reunites both children with their fathers, bringing closure to Tomoya’s strained relationship with his father and repairing his broken family. 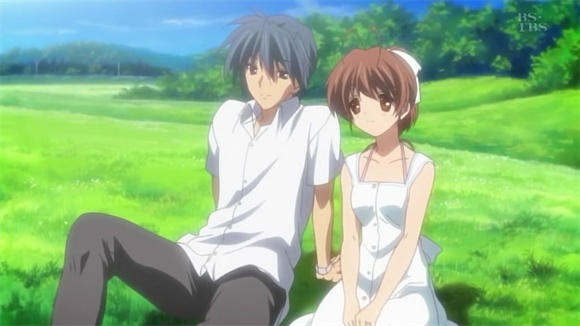 Ushio and Tomoya begin a happy life together, the one they should have been living from the start, until disaster strikes; Ushio begins showing signs of the sickness that plagued Nagisa for years. I didn’t want to believe it; I thought that no writers would be sadistic enough to pile that much hardship on Tomoya (and my favorite series is Saikano, which basically exists to torture its characters). After all, it was so sudden. Even though it was pretty obvious what was going to happen (for all one epsiode of warning we had) I held out hope that somehow, she’d pull through. But in the span of five episodes, Ushio became part of Tomoya’s family—part of our family, in a way—and then disappeared. Even for Key and KyoAni, building a character that quickly is difficult, but they did it, and Ushio’s death was just as painful as her mother’s. And then, something happens. The mysterious and strange Illusionary World segments finally join the main storyline, and Tomoya gets another chance, to do everything all over again. 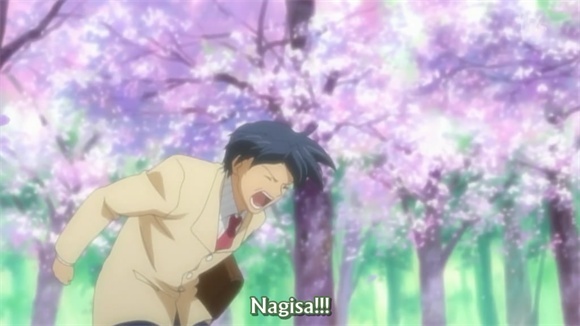 Tomoya again calls out to Nagisa at the foot of the hill, and awakens just after Ushio’s birth… and so does Nagisa, in a city full of glowing lights. Even though the story could have ended with Ushio’s death, I don’t think it fits the rest of the series; somehow, something would still be missing. Perhaps that’s because we wouldn’t know how Tomoya lived afterwards; perhaps it’s just my inability to cope with Ushio’s loss. Regardless, I’m happy that the True End exists; I’m happy that Tomoya’s story doesn’t end so painfully. And I’m happy that hope got a second chance. That’s why this is Moment #9.